E-commerce and real stores are often thought of as similar modes of targeting the same demographic but they are very different. The most significant difference between them is whether or not one can capture shopper’s behaviors. E-commerce sites, which are able to capture everything that a user does, need to take advantage of this and use it to create an enjoyable user experience that can lead to repeat users and increased sales. 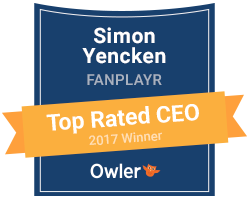 This article covers Fanplayr, a web-based customer service tool that allows timely messages to be sent out using real-time user analysis, leading to improved Conversion Rates (CR). We interviewed their CEO Simon Yencken and VP Derek Adelman visiting from the U.S. together with JAMU Inc. CEO Hideaki Ueda about data-based behavior analysis. What can be learned from user behavior on an e-commerce site? Simon Yencken explained the characteristics of e-commerce purchasing behavior based on an year- long study with Milan’s Bocconi University. The study surveyed 22 million visits captured by the Fanplayr service in Europe throughout the year. One thing that sticks out is that while the number of pages browsed increased compared to 2015, globally CR are gradually decreasing. In the first quarter of 2014, the number of pages viewed was 2.09 pages per session, compared to 2.28 pages per session in the first quarter of 2015. CR, on the other hand, decreased from 2.54%inthefirstquarterof2014to2.32%inthefirstquarterof2015. Theaddto cart ratio also decreased from 8.31% to 7.39%. Interestingly, the first page the user visited on the site had an impact on CR. When that page was a blog, the CR is close to 0%, but when it was a product page, the CR was about 1.3%, which is higher than the average CR expected from the site. The length of time a user stays on site and its relationship to CR: 86% of the e- commerce sales comes from users who stayed longer on the site than average. The longer the user stays on site, the higher the possibility of his/her purchasing. How do we connect user behavior analysis to purchasing? The key lies in engaging the user who had a pleasant purchasing experience on your site. Fanplayr analyzes a user’s behavior in real time and presents messages, coupons etc. only to those users it deems necessary. This increases the chances of presenting offers to users who are seeking them and enhances their user experience, thus creating a positive cycle of visits and purchases. Fanplayr is unique in that it may choose not to make any offers or real-time messages, based on its analysis. For users who have already decided to purchase, this allows for the site to produce more profit. Random offer distribution can unnecessarily cut into a site’s profit margin. A better approach is to issue coupons only to those who need a push, based on how they behave on site. Fanplayr claims three goals. To increase a site’s revenue and profit. To enhance a visitor’s experience when visiting a site. Lastly, to build a positive relationship between the e-commerce site and its customers and to increase site loyalty. In summary, Fanplayr’s role is to enhance the user’s experience by acting upon their behaviors and making them a repeat customer. Even if a site owns data about their users’ behaviors, it is not easy to analyze this info and to act upon it when it is relevant. If you want to increase your revenue by making use of the user behavior analysis made only available because you are an e- commerce site, why not give Fanplayr’s web-based customer service tool a try?